Damian Lane’s big day started when he guided Naantali to victory in the opening race at Flemington. Jockey Damian Lane has kept alive faint hopes of claiming a first Melbourne jockeys’ premiership riding four winners at Flemington. Lane trails Craig Williams, chasing a seventh title, by six winners with the Sandown meeting on Wednesday and Caulfield next Saturday the two remaining meetings. He started Saturday’s meeting guiding Naantali to victory in the opening race before wins aboard Visao, Brave Song and Sixties Groove. “It was a big day obviously,” Lane said. Lane said he had ridden four city winners at Morphettville previously and believed the six-win premiership lead Williams had was too great. “I’m more than likely going to go to Adelaide next Saturday to ride Nature Strip so that would be another meeting I’m not here for,” he said. Trainer Darren Weir said Sixties Groove would need work on his racing manners to win a good race in Australia. 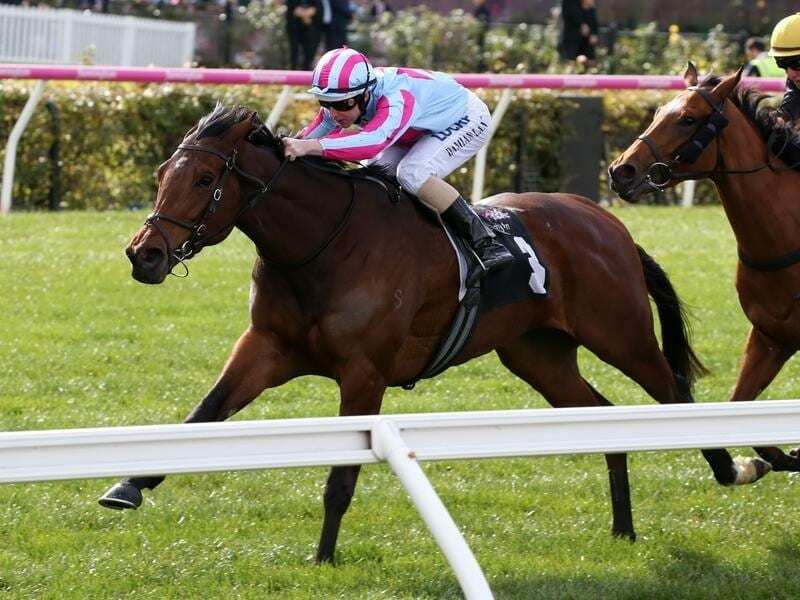 The Irish-bred import made it back-to-back Flemington victories taking out the KA Morrison Handicap. Weir said there were of worrying signs as Sixties Groove ran down to the rail after striking the lead inside the final 200m. “Hopefully there’s nothing worrying him,” Weir said. “He’s got to learn to switch off early otherwise when he gets up in class it’s going to be a lot harder for him,” Weir said. “Once the race got sorted out he tucked his head under and relaxed and he got a lovely cart into the race and put them away, but he did lay in very bad. “Going forward, he’s a beauty. “I’m not sure what we do with him but we’ll have to head to a good race somewhere with him I guess. The meeting was also one to remember for apprentice Nathan Punch, who brought up his first city winner on Invincible Al in the the VRC Thanks Terry Bailey Handicap. “It’s great to finally get my first city winner and it means even more to be able to do it on the big stage at Flemington,” Punch said.